[Image: The basic platform; design your seastead atop this and win $1000]. The Seasteading Institute is sponsoring a design competition to see who can most interestingly visualize a permanent, microsovereign architectural state at sea. 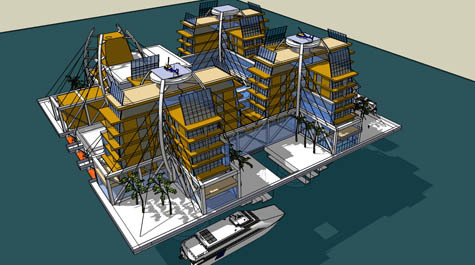 "A seastead," they write in the competition brief, "is a floating platform that allows people to permanently settle the ocean as they do land. 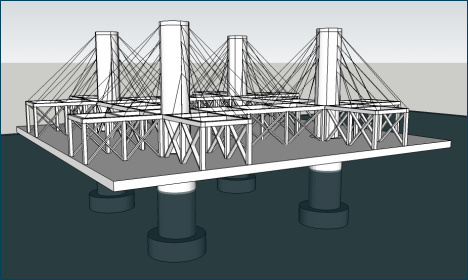 Professional naval engineers have already designed a bare platform – a structure about 400x400 feet, roughly the size of a city block. What you build on the platform is up to you. It may be a hospital, a casino, a residential community, a cricket stadium, or something entirely different." There are some basic engineering constraints that participants will have to heed, as explained both in the call-for-entries and in this forum, and a sample design has been supplied (see images above and below). But I think it'd be absolutely fascinating to annualize this, and launch a kind of eVolo competition for offshore platform design. The skyscraper designs that come out of eVolo might gravitate a bit too strongly toward the biomorphic/diagrid/arbitrary fractal tiling end of contemporary architectural design, but each year's results are always worth checking out. So if architects were asked to rethink the spatial design of offshore libertarian self-rule, and to do so as part of a high-profile annual competition, what sorts of structures might we see? [Image: An illustrated variation of the sample design, from Wired magazine]. For a little more background, Wired's Chris Baker covered the Seasteading Institute last month. Baker wrote that the Institute "doesn't just want to create huge floating platforms that people can live on," they are "also hoping to create a platform in the sense that Linux is a platform: a base upon which people can build their own innovative forms of governance. The ultimate goal is to create standards and blueprints that can be easily adapted, allowing small communities to rapidly incubate and test new models of self-rule with the same ease that a programmer in his garage can whip up a Facebook app." Here, architectural design would actually help to catalyze new forms of political sovereignty. The cultural possibilities for these offshore spaces are effectively without limit – and they would be self-policed, falling outside the bounds of international law. This opens up a number of legal (not to mention moral) quandaries. Baker reports that Patri Friedman, the Institute's co-founder and executive director, speaking at a Bay Area conference held last fall, "notes that some enterprises – like euthanasia clinics – would incense local authorities, but almost all the ideas attendees [at that conference] come up with would capitalize on activities that skirt existing laws and regulations: Fish farming and aquaculture. Prisons. Med schools. Gold warehouses. Brothels. Cryonics intakes. Gene therapy, cloning, augmentation, and organ sales. Baby farms. Deafeningly loud concerts. Rehab/detox clinics. Zen retreats. Abortion clinics. Ultimate ultimate fighting tournaments." So what might these platforms look like? Submissions are due by May 1. If such floating enclaves are outside territorial limits of a country, how will they prevent being raided by pirates and other unfriendlies? polizeros-if the history of libertarian nations is anything to go by their biggest threat will be the Samoan army. Just google "Republic of Minerva"! The start of a real-life Armada from Mieville's "The Scar?" 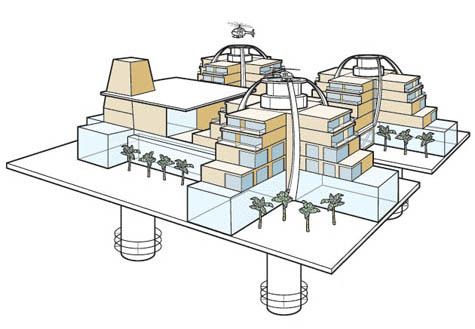 Apart from the faintly ridiculous nature of the Seasteading "Institute" the suggests for making the platforms viable were all so ludicrously... small. Not only were they attempts to make them capitalistically attractive in the most base of randian ways, skirting the law is in the justed instances just a nice way of saying, openly flouting the legal and ethical laws of their territorial hosts and neighbours. The risk of being attacked by pirates as suggested by the commentor above is a serious concern to be sure, but given the infantile nature of the suggested trades for these floating compounds it seems more likely the nearest government would be the ones most likely to be sending in the destroyers to move them off. Abortion clinics are all well and good, in a haughty moreally superior way perhaps, but were there any suggestions raised that didnt involve the death or environmental destruction of something ? I'm not someone who agonizes over the brutality of nature but it seems to me that the only purpose of these places so far suggested by the luminaries gathered to discuss seasteading involved blurring the definition of murder, perhaps as douglas adams suggested they could just try respelling it and see if the US government takes such a wry view of their frankly rather dystopian project. Though in your post you make the idea of linux style open source governance and the creation of micro states sound very appealing, and I for one would love to live in a world where such is possible, but the bar of entry in the case of seasteading make that vision of a world somewhat impractical. Seasteading isnt terribly open source when the platforms are going to cost tens of millions of dollars to construct, let alone maintain. And even if they manage to see off threats from the sea, who will protect them from threats from the land, a land with no laws designed to make what would be a crime possible, how would that not be a magnet for organized crime? I'm sure the yamaguchi-gumi would be in control of any platform that came within a hundred miles of the coast of Japan, I would expect no less efficiency from organisations else where. I feel sure I've drifted from the point somewhere. Seasteading, it's a nice idea but it's currently plagued by libertarians, a race genetically predisposed to large langauge and small ideas. If he or she were to spatialize her comments, I think Anonymous of March 01, 2009 6:51PM would have a very interesting proposal to send to the institute. This post, by the way, reminded me of the new ad campaign by RoyalCaribbean Cruise Line -- The Nation of Why Not -- which skirts close to this whole Seasteading utopianism. We, the people, hereby secede from land and declare ourselves a Nation of Why Not. From this moment on we will be a nation adrift. We will cast off conventions of life on land, and set sail free to ask, Why not? Why not ice skate on the equator, sunbathe past glaciers, climb mountains at sea, and learn a foreign word like yes. Or why not do nothing at all. Declare your independence. Become a citizen of our nation: RoyalCaribbean -- The Nation of Why Not. The idea that these platforms will act as isolated incubators of new forms of society is compelling. This experimentation of what constitutes a community is already going on at a virtual level and this translation into the actual, though perhaps idealistic and ultimately impractical, points to our digital future. One day, our surroundings will be software, tailored and constantly re-tailored to our exact specification, and the human/architecture distinction will be invisible. This may well be seen one day as a conceptual precursor. just something i came across which i thought you might like to look at. I'm going to keep my interpretation limited to form and function. Having lived on the sea (literally) or meters from the sea for my entire life, I'm interested to know where designers will draw inspiration from when creating design solutions for "Seasteads." My imagination is limited to base structures such as ocean-bound oil platforms (not pretty, but proven effective), and in terms of structures that are proven to sustain high winds and punishing seas, I envision examples such as the structure/ form of a ship, lighthouse, and again, oil platform. Fat on bottom and tapered at the top works like a charm in those conditions. But when you are talking about creating a space where people may choose to live or work in a non-essential role (opposite of a rig worker), how will designers balance a consumer's expectations for beauty with a functioning/ sustainable structure? Really thought-provoking. Thanks for sharing! Indeed interesting but I join the comments above and can't find for it any function other than financial and law "heavens" which I tend to disapprove, especially since it cannot be a sustainable and autonomous environment. And I do love ships. I'm thinking a village of stacked residences around the outside of the square, with a stepped pyramid of commercial enterprises in the center, with food gardens on the steps. Solar collectors of various kinds around the outside of the structure. Or get power from tidal forces. The gardens are sheltered from the salt spray by the ring of residences around the outside of the structure. It might work even better if you do this with multiples of this grouped together, so there's enough sunlight in the center to farm. A lot of solar module shading in that design... Will likely have to move all to roof for even remotely economical power -- possibly necessitating more roof space and, effectively, an overall redesign. Having just read the post by "Anonymous" above, I retract my previous comment. How this structure is to be powered should be the least of anyone's concerns. My concern is that architects with the keen ability to portray solar so aesthetically are spending their time in this way. Perhaps the result of such misplaced efforts will lead to a 20 ft rise in sea level in the next 2 decades (conservative?) which, in turn and ironically, will perhaps grant more merit to this design. the first thing that came to my mind is the story of the game bioshock or captain nemo, rather than the 'country gentleman' a new generation of 'country intellectuals' try to escape the realities of the world and adopt a tabula rasa approach, meanwhile these problems in the real world wont just go away. i think these 'linux test beds' can happen in the everyday right now. for example in the classroom similar to steiner schools or autonomous allotment societies popping up in leftover post-industrial landscape. the infamous s word, yes, sustainability, is vital here. not just chucking money in making new frontiers and equally the s word should play a role in political engineering as well.